15 Best Bridal Makeup Looks From 2017 - #Weddingz2017Rewind! You have to look your finest self on your wedding day – that is a given. So having the right bridal makeup tips by your side is important, especially in this age of HD photography where every angle is captured in stunning detail by candid photographers. Here’s helping you with the same. We at weddingz.in are all about inspiration and we absolutely love the real brides who stun us from time to time. That’s why we’re doing a series of 2017 round-up on the brides who gave us major #WeddingInspo and after a much loved post about Best Wedding Lehengas we are back with another one as promised! 1. The classic smokey eyes! This bride went the less-is-more way for her reception night makeup and looked stunning! We loved her glittery yet very subtle smokey eye makeup, natural base and the hint of gloss on the lips. 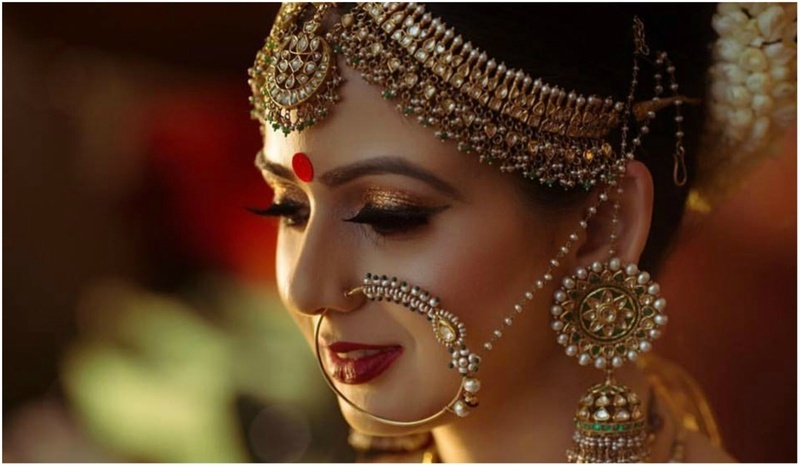 They say ‘traditional Indian bridal makeup is incomplete without the solah-sringar’ and this bride has gone traditional all the way for her pheras. Her finely contoured face makeup complements her shimmery eyes, perfectly done brows and dark lips. This one is another stunner who went the traditional yet contemporary way for her bridal makeup. She opted for a jazzy look with dark matte lips while letting her eyes do all the talking! We like how her dual shades of eyeshadows match the exact tone of her lehenga. How stunning is this bride with a million dollar smile and her D-Day glow on point? She chose a very natural bridal day-makeup look with dramatic eyes, subtle blush and a matte pink color on her lips matching her lehenga. We like how the inner V corner of her eyes are highlighted for an ethereal finish. Anushka Sharma made a stunning bride with her minimal day-makeup look complementing her blush pink lehenga in the most elegant way ever. Her bridal hairstyle is taking our breath away too! Sagarika Ghatge had a court marriage and went all minimalistic for her bridal look that day. Even her beauty look comprised of a natural day-makeup with just a dash of pink on her lips, letting her bridal glow shine on! Don’t you adore this Kashmiri bride with that natural blush? We too can’t take our eyes off her perfectly contoured face makeup, very natural lips and soft smokey eye makeup for an extra bit of oomph. How stunning is beauty in orange? We are in love with those youthful brows, glowing complexion and dramatic eye palette of orange undertones with a cat eye flick! This one is a winner too with her dramatic eye makeup on point! We mean sure, the regular gray smokey eye makeup is gorgeous, but throw some earthy tones of peach and burgundy in there and suddenly it's all a little more unexpected and completely awesome! She has also complimented her deep burgundy color by using orange on her lips and cheek, making sure that everything doesn't look red. We like how this bride’s foundation has exuded an airbrush finish and the eyes use more neutral tones of bronze and gold. The pop of color in shades of pink for the lips brings the whole look alive too! Sasha Rawal choose to take the minimal route too by choosing a very light colour for her wedding lehenga with an equally minimal natural day face makeup for her bridal look. How cute is the pop of pink on her lips, right? Here's what a monochromatic palette does for your face: It prevents any one thing from standing out so you look overall lovely and understated! We love the addition of dark lips to her dual toned shimmery eyeshadow though! How cool is this bride’s understated look? She has kept her dewy glow intact while perfectly highlighting her face and keeping the contouring on point. What's grabbing our attention though is the shimmery eye makeup and that blush on the cheeks! She's also one of the few who didn't use eyeliner or kajal, we say that's a very bold move to pull off! Bipasha Basu broke the internet (literally) when she got married and we can’t our eyes off of her completely traditional bengali bridal face makeup and that perfectly done winged liner! Let's all bow down to the makeup queen on this one. With our list of best bridal makeup tips from 2017 coming to an end, we hope you have, by now, figured out what sort of makeup are you going to have for your wedding! Whatever makeup you choose, just make sure it compliments your personality and your mood at the moment. 1. Plan your looks from your makeup kit. 2. Check the light in the bridal suit as it plays a big part in getting ready bridal pictures. 3. Don’t opt for anything too in-trend. Always remember you’ll have to live with photos from your wedding for the rest of your life, so it’s best to avoid statement looks and opt for classic and evergreen makeup and bridal hairstyles. 4. Do not over-correct any under eye circles while doing your eye makeup. If the concealer is very light, that will be the only thing you see in the wedding photos. 5. Don’t apply false eyelashes for the first time on your wedding day. Practice first! 6. Avoid stress at all costs, feel happy, because you are beautiful within and that’s all that matters!